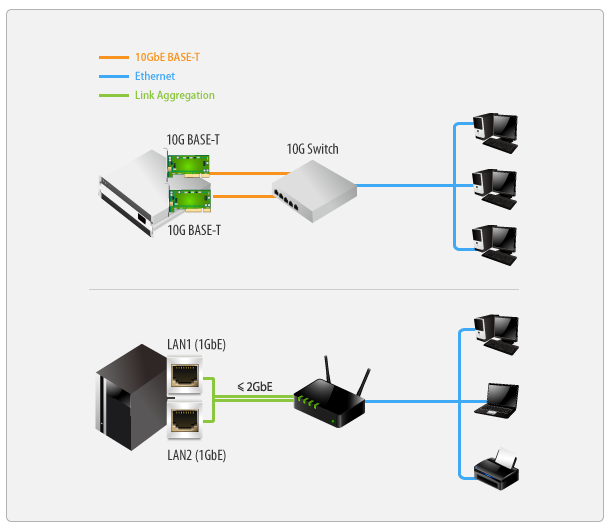 Link aggregation is a method used to bond multiple links between your NAS and your switch into bigger larger and quicker connection, increasing your network’s capacity while maintaining a stable transmission speed. 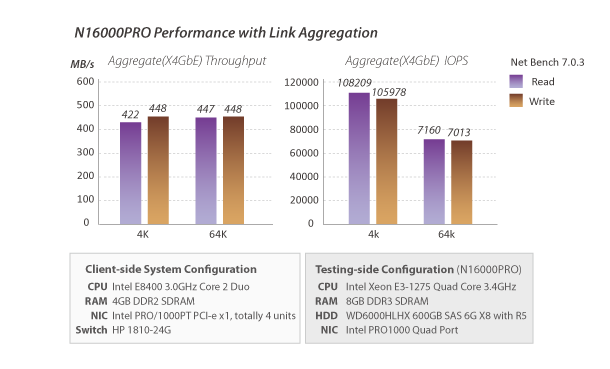 Because link aggregation does not require significant changes to hardware, it is also a cost-effective means of improving network performance. Employing link aggregation will optimize resource utilization, maximize throughput, minimize response time, and help in avoiding overload. Thecus NAS support 7 ‘flavors’ of link aggregation: Load Balance, Failover, 802.3ad, Balance-XOR, Balance-TLB, Balance-ALB, and Broadcast. High-end data centers often need a level of speed that today’s average Ethernet connection cannot provide. Fortunately, Thecus NAS products are ready for a number of emerging technologies. With a built-in PCI-e slot, business users can easily add a 10G Ethernet adaptor for lighting fast transfer speeds, proving again that Thecus NAS are designed to satisfy the toughest needs of today and tomorrow.